Now you can keep your Linux Computer Active even when you are not using it. The Software Application provided here triggers Automatic Mouse Movements due to which a Linux Computer with GUI keep on getting automated input and hence stays active. 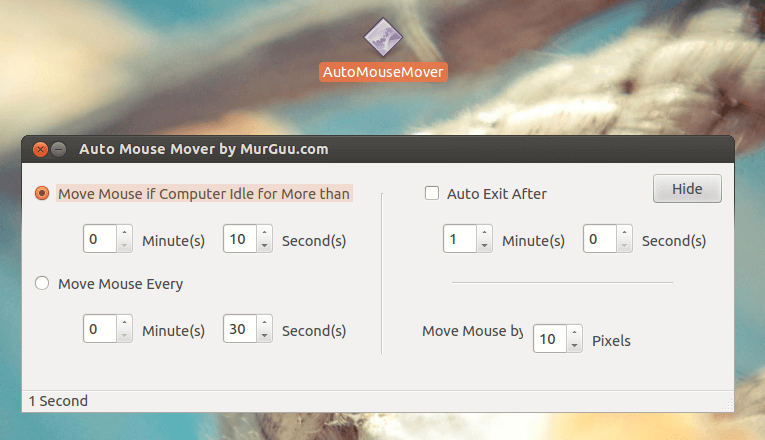 The given below screenshot of the Linux Application to automate Mouse Movements has been captured on a Ubuntu Desktop and with appropriate libraries, it works on other Linux Distros like Linux Mint, Fedora, OpenSUSE, etc. Download, extract and run the Mouse Mover Application. There is no installation required and the application should work just fine without any extra libraries on any latest Linux Distro. The above screenshot displays the main screen of the software from where you can configure various parameters of the software. All the action performed by the software are configurable and are offered in a single screen. Given below are the configurable parameters as displayed in the above screenshots. Automated Mouse Movements only when your Linux Computer is left inactive or idle for configurable number of minutes and seconds. 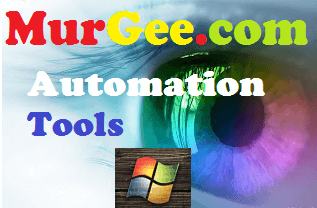 You can alternatively configure the software to skip the idle check and continuously keep on moving mouse cursor at timed interval configurable in terms of Minutes and Seconds. Optional Auto Exit feature allows you to time the software to automatically exit after configurable number of minutes and seconds. This way you can configure the software to keep your Linux Computer Active only for specified duration and then later on let the automated power management settings kick in and save power and let the Linux Computer utilize the power saving features. The last setting is the number of pixels by which Mouse Cursor is moved. A lower value of the Pixel count will ensure that your Linux Computer is kept Active by the software, however the automated Mouse Movements are barely noticeable. On the other hand a large value of Pixel count ensure that you can visually see the automated Mouse Cursor Movements. Once you are done configuring the software parameters as described above, you can hide the application’s main screen so that you can fully utilize your Desktop Screen. Depending on your Linux distro, the System Tray can be at the bottom or at the top. The Screenshot below displays the Mouse Movement Application running on Ubuntu which has it’s system tray at the top. 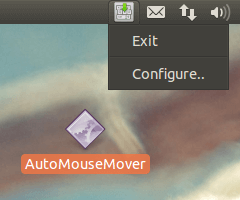 Note that the Linux Mouse Mover Software Menu offers you to open the main screen of the software and configure it. You can also exit the software from the Menu and then later launch it manually from the Application Icon. In the above screenshot the Application has been placed on the Desktop and it is keeping the Linux Computer Active and Awake so that the Linux Computer does not shuts down automatically when left inactive or idle. The Linux Application presented above is available on a Free to Download and try basis. There is a usage based limit in the software. The Software download link provided is a 32 bit Linux application which does works on 32 bit and 64 bit Linux distros. In case you do have any other operating system, you can navigate to the Keep Computer Active post of this blog which offers similar Mouse Movement Applications on Windows, Macintosh and of-course on Linux.